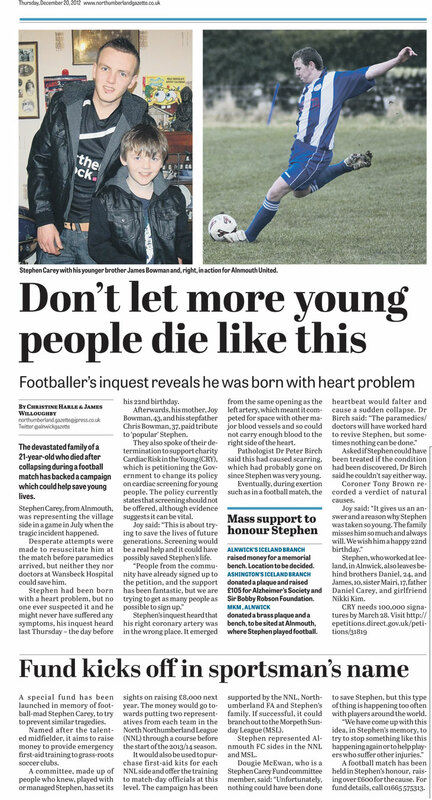 A series of articles were published in the Northumberland Gazette today which included details of the coroners report which whilst incredibly sad to read at least bring something resembling an answer for this tragic incident. In addition the publication also included a piece announcing the formation of the very fund you are now reading, The Stephen Carey Fund. Following many discussions between teammates, friends and family close to Stephen as to how best remember and honour him it was agreed to do something positive and constructive to help others. With a football match already undertaken the formation of the fund now draws together the determination of those involved into sharp focus and with ideas in abundance 2013 looks like being a year of promise and hope for all those affected by this tragic event.